It’s been a very busy week at Handmade by Allison…lots of invitation orders going out, designs to do and emails to answer…which led me to start thinking about a vacation to a warm and sunny place. 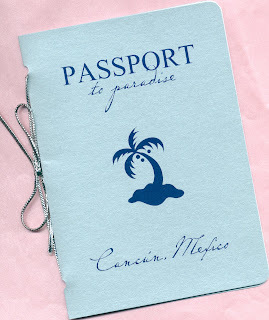 Or, it could have been that the udpates I was making to Alena’s ‘Passport to Paradise’ save the date were making me dream of umbrella drinks and blue water. Either way, paradise sounds really nice right about now! Alena is getting married in Cancun later in the year and is sending her guests a booklet with all of the details on the big day. I designed the booklet to look like a traditional passport with a few pretty touches. I also designed a boarding pass magnet to include in the back cover of the passport. Hope it makes you think of sunny places too! Today was a busy day. 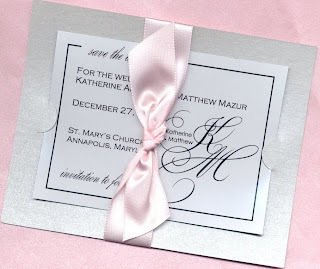 We wrapped up two orders…one wedding and one corporate event…and pink and black were the colors of the day! 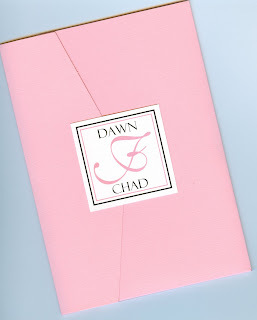 Dawn’s invitation is a light pink horizontal pocket design with black and white details. 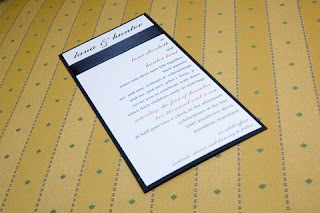 We mailed out these invitations to Dawn’s guests to take a task off of her to do list. 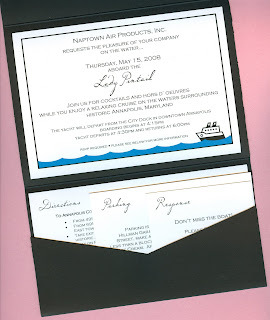 The corporate invite was also a pocket, but with the pocket on the bottom. Since the event is taking place on a yacht, we added touches of water to the invite panel and response card and a small yacht graphic. We used the same graphic on the blue mailing envelopes….water, water everywhere! A veil and sand dollar table numbers…okay, so not quite the perfect combo, but that is what we shipped out today. Of course, it was to two different brides, but I thought the visual was entertaining! The veil was a very simple design of ivory, cathedral length tulle, to be worn of the top of the bride’s head. Mary’s wedding is later this year, but she wanted it for her final fittings and hair preview. Onto the sand dollar table numbers…Karen is getting married in Florida and wanted to add a touch of real sealife to her tables. I’ve done these for other brides, but Karen wanted her table number to be in gold, so that is what we did. These are freestanding, real 3″ sand dollars with the table number hand detailed onto the front of the sand dollar. Below is a picture of these that I did for another bride. Enjoy! Today, Handmade by Allison was a showcased vendor at the Historic Inns of Annapolis Wedding Show. It was held at the beautiful Governor Calvert House on State Circle. There was a great bride turnout and we’re looking forward to working with some “Historic” brides! On another note, the website will be updated at the beginning of every month with a featured wedding or vendor. In April I’ll be showcasing Lana & Hunter’s wedding from December of last year. Here’s a taste of what’s to come! Today, I had the pleasure of meeting with Katherine and Matt…for a second time. We met last year, at my old favorite meeting spot — the cafe inside Barnes & Noble, regarding their December 2008 wedding. Today, Katherine and Matt had the opportunity to sit down in the new studio and re-visit all of the wedding items that Handmade by Allison is creating for them….and boy are there a lot of ’em! Katherine is a very organized bride and brought her wish list back to me today with a few updates and additions. I really think their wedding is going to be spectacular. Below is a picture of their save the date…this will give you a taste of their style and colors. Happily ever after!